How Big is a Gold Bar? Availability: In stock and ready to ship! Ask us about our Security Safe Offer! Personal information submitted through our website is never shared. *All fields required. By submitting my information, I agree to the Website User Agreement. The San Francisco Mint opened in 1854 to serve the gold mines of California. The $10 Liberty Head gold coin was the first to be struck in the design, and began production in 1838. This was the first time the eagle was minted since 1804, prior to which it bore the Turban Head design. This is why the $10 piece was referred to as the eagle. The Liberty Head eagle can be found in two variations: those with “no motto,” minted from 1838 to 1866, and those “with motto,” minted from 1866 to 1907. The “motto” in question is the famed phrase, “IN GOD WE TRUST,” and was added on a scroll above the eagle on the reverse of the coin. Other than this addition – as well as a minor tweak to Liberty’s portrait in 1839 – the design of the coin remained virtually unaltered throughout its production. Will Peak Gold Come to the Rescue? Get specials & notifications right in your inbox. United States Gold Bureau is a private distributor of Gold, Silver & Platinum coins from the U.S. Mint and is not affiliated with the U.S. Government. 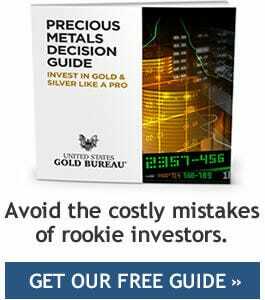 Information on this web site is intended for educational purpose only and is not to be used as investment advice or a recommendation to buy sell or trade any asset that requires a licensed broker. As with all investments there is risk and the past performance of a particular asset class does not guarantee any future performance. The United States Gold Bureau, principals and representatives do not guarantee to clients that they will realize a profit or guarantee that losses may not be incurred as a result of following its coin collecting recommendations, or upon liquidation of coins bought from the U.S. Gold Bureau. All content and images are owned by USGB and may not be reproduced without written authorization. © Copyright 2019. USGB, LLC - All Rights Reserved.